Setting up house with a partner is both exciting and challenging. Nesting is about trying to make each other happy, combining lifestyles and acquiring things that bring equal joy. It’s a time of promise and potential. Like many couples today, Amy Azzarito and Mark Fujiwara married later in life—he was 49 and she was 40—and already had fully formed lives and tastes. And they wanted a mutually satisfying style. Not his or hers, but theirs. A longtime Brooklyn resident, Azzarito had moved back to California to be nearer to her sisters—and find a permanent relationship and a permanent home. On her first eharmony date with Fujiwara, they talked for two hours before opening the menu. With foresight, she drank nothing but water to avoid seeing him “with wine-colored eyes.” They didn’t live together until they had been engaged for several months. In the bedroom, a window seat topped with custom blush-pink velvet cushions and extra-large storage drawers underneath provides storage without distracting from the view. 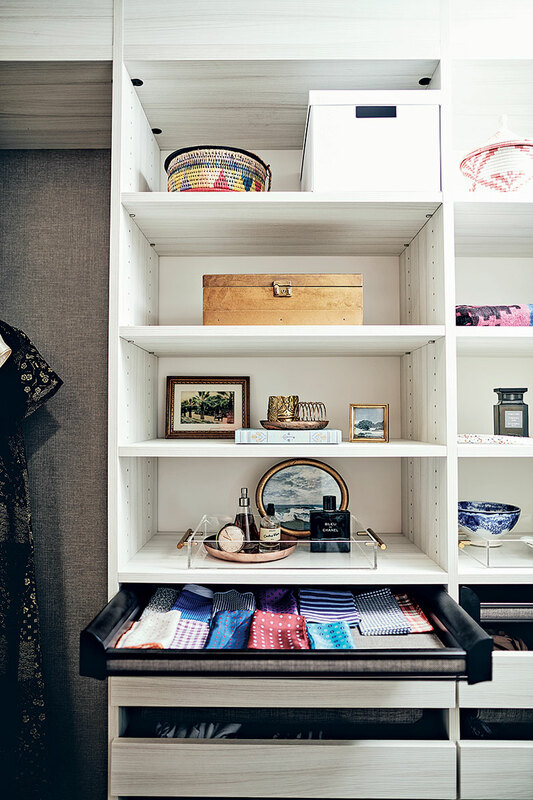 Fujiwara’s pocket square collection lives in a pull-out tray in the closet. “He wears a suit every day, so that’s how he expresses himself,” says Azzarito. 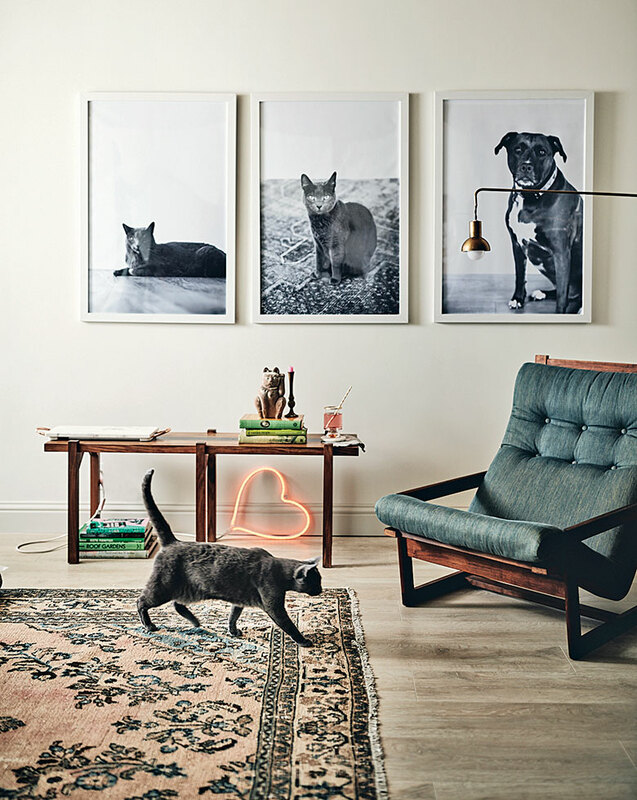 Azzarito shot, edited, and framed enlarged photos of their cats, Loki and Freya, and pit bull, Romy. After a honeymoon in Japan, Azzarito and Fujiwara moved in. Their living room is a gathering place for family—particularly Fujiwara’s children, ages 15 and 13, from a previous marriage; his extended family who lives nearby; and Azzarito’s sisters. Their life together has begun—and with it, a new culture for a union of two, surrounded by the people and things they love most.